0ne never knew what might inspire a session of spontaneous poetry by the Vidyadhara, or at what time of day or night. Vajrayana transmission at the 1979 Vajradhatu Seminary was such an occasion, and a few invited guests, who joined Rinpoche in his upstairs sitting room at Chateau Lake Louise following this teaching, were in for a treat. Though it was not unusual for Rinpoche to spend time writing poetry, this had been a year of much instruction for his students in the composition of spontaneous songs expressing one’s realization, known as dohas in Sanskrit. The Vajrayogini practitioners, in particular, had been encouraged to write group dohas in the context of their feast practice. John Rockwell, the only translator present among the guests, recalls it being quite a late night. At first Rinpoche was very quiet. 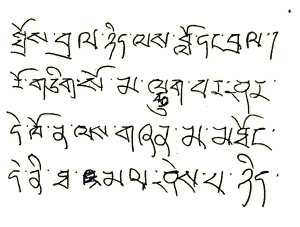 Then, he began to say a word in Tibetan, like “soma,” indicating for John to offer a translation, “fresh.” After a bit more of this, the Vidyadhara began to compose a poem, which he did in Tibetan by writing this down on a sheet of notebook paper, using the most handy writing instrument nearby—a rather crude marking pen. 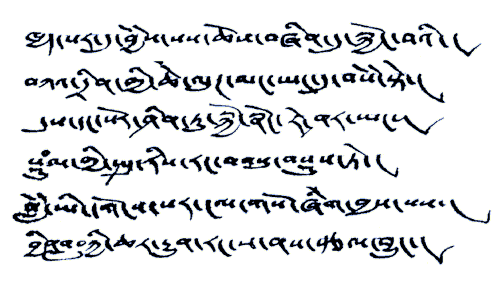 John proceeded to translate the poem, with the Vidyadhara’s participation, and then this was shared with the assembled group. A number of dohas sprang forth that night, and their immediate vividness, mixed with the necessity for translation on the spot, continued the quality of that evening’s transmission quite wonderfully. Dawns as one taste, fresh relaxed. A cripple runs on the primordial plain. A mute proclaims the dharma of prajna. A deaf man listens to the command of mahayana. At that time, mahamudra arises. The only father guru is very pleased. Chögyam is drunk with the liquor of one taste. At that time, a ganachakra occurs. At that time, Marpa Lotsawa laughs. I pay homage to you who dry up the ocean. I am always surrounded by mirage friends. These friends are like a treacherous pathway. These parents are like poisonous food. I am without friends or parents. I take delight in cultivating the dharma kingdom. Getting old, still I grow younger. In particular, my teacher had nurtured me with maitri in accord with the dharma. But then even the finest hairs of suffering dissolved into the natural state. Who bestowed a rain of blessings right there.